Fall has set on the Tillamook Coast, and while the days may have gotten shorter, the fun is only just beginning. This autumn, join the Explore Nature Series in some of their most popular and unique events all year long. “We truly love this time of year – there is so much going on between hikes, paddles and guided tours, you can find something to do nearly every week that will take your appreciation for the Tillamook Coast to a whole new level,” said Chrissy Smith with the Friends of Netarts Bay. Coming up on Oct. 22 is the Wild Mushroom Walk with the Lower Nehalem Community Trust. 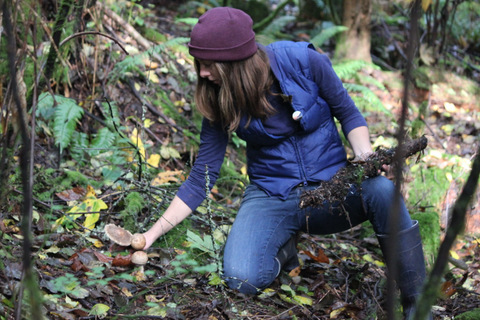 Ida Gianopulos will be leading this guided mushroom walk through the Sitka Wetlands rain or shine, focusing on the ecology of fungi and how they shape the forest around them. Participants will learn basic mushroom identification and how to use a guidebook during this ecology-focused walk through a wetland preserved by the Lower Nehalem Community Trust. Ida earned her B.S. in Ecology at Humboldt State University, and became involved with land conservation while working as the stewardship assistant for the Lower Nehalem Community Trust. One of Ida’s greatest passions is mycology, and she is an enthusiastic teacher of the wonders of the fungal kingdom. Registration for these events is required at explorenaturetillamookcoast.com. Both are free and are part of the Explore Nature series of hikes, walks, paddles and outdoor adventures. Explore Nature Series events are hosted by a consortium of volunteer community and non-profit organizations, and are meaningful nature-based experiences highlight the unique beauty of Tillamook County and the work being done to preserve and conserve the area’s natural resources and natural resource-based economy. They are partially funded through the Economic Development Council of Tillamook County, Visit Tillamook Coast and the Travel Oregon Forever Fund. Learn more at www.explorenaturetillamookcoast.com. Oct. 20 – Hike Bay Ocean Spit. 1 – 4 p.m.
Oct. 31 – Plant Native Seeds. 10 – 3 p.m.
Nov. 3 – Marvelous Mushroom Adventure. 9 – 12 p.m.
Nov. 17 – Salmon Watch Science Hike. 10 – 12 p.m.